Some readers may know Lemmy Kilmister best from Motorhead’s double decker sandwich of metal and punk. 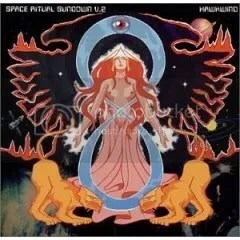 Other readers may know that Lemmy’s best work was spent with his previous band Hawkwind, who singlehandedly changed the face of metal, prog and punk with a series of classic albums: In Search of Space, Doremi Fasol Latido and Space Ritual, from which this recording is culled. If you are unfamiliar with Hawkwind, their early 70s work alternates between psychedelic, speedy proto-metal and whacked ambient instrumentals laced with the dalek ramblings of Robert Calvert. The original Space Ritual compiles 88 minutes of a 1972 set that ranks as the best live album ever in my opinion. The recorded version were raw, throbbing psychedelic paeans to all things heavy, but this alternate version blows the original away. The original live set was too long to fit on the the double lp, so some of the more noisy, abstract stuff was left off as well as lengthier versions of their seminal tunes. “Time We Left” and “Brainstorm” are expanded while “7 by 7″‘s cosmic anthem is tacked onto the release. If you already love Space Ritual, please download so you can experience one of the rare occasions where your favorite album can actually be improved upon through careful editing. If you are unfamiliar, I envy you. You now have an opportunity to experience one of the best albums of the 70s. Like your music stoned, heavy, replete with echoing sax solos and endlessly inventive? Then, i implore you to explore their bombastic epic.